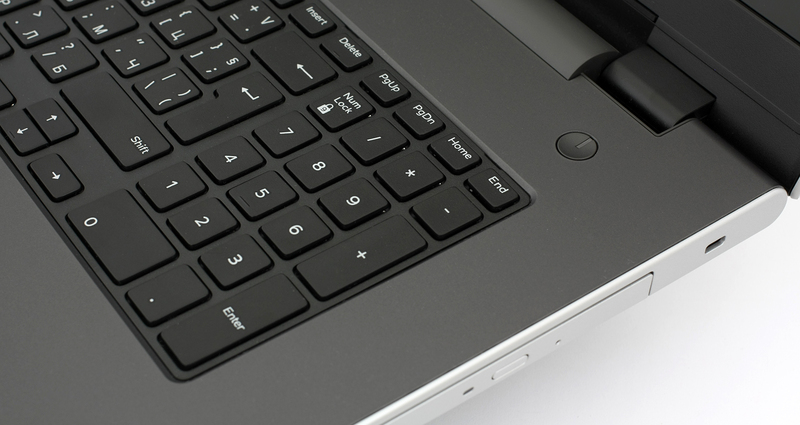 Most of you might have already noticed that the 17-inch laptop market seems a bit… limited. This leads to higher average prices and the products don’t necessarily offer a compelling reason to go for the bigger screen instead of sticking with a 15-incher and better overall specs. 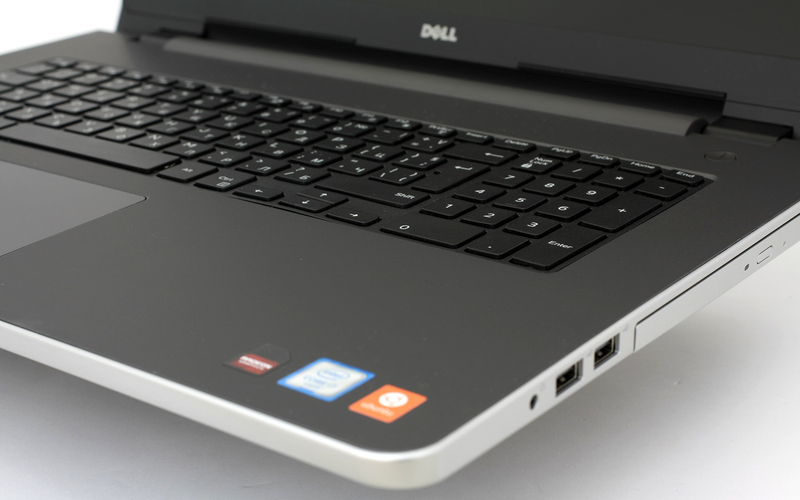 The new Inspiron 5759 falls in that category and we are in a love-hate relationship with it. You can find the laptop for around €800 in Europe or a little bit less in the USA but there’s a big “but”. The version we are testing features a discrete GPU while the US version relies on the Intel HD Graphics 520 iGPU found on the Core i3, i5 and i7 processors. Still, the price is abnormally high for a device sporting Intel Core i7-6500U and the barely faster than the HD Graphics 520 discrete graphics processor AMD Radeon R5 M335. We were expecting maybe an IPS panel to compensate for the underpowered GPU or more storage options, for example. 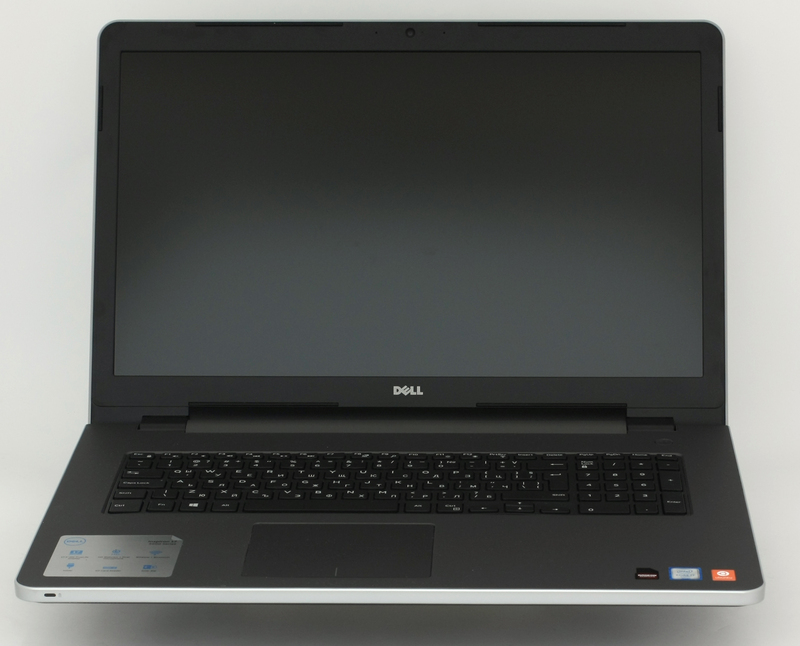 Nonetheless, we are expecting more than good image quality since last year’s Broadwell version, Inspiron 5758, offered a budget TN panel that showed excellent properties like high contrast, brightness and wide sRGB color gamut coverage. So we are mostly focusing on the hardware front since the 5759 looks and feels almost identical to its predecessor. The big box containing the laptop comes with a DVD with drivers, user manuals, AC adapter and charging cable, of course. 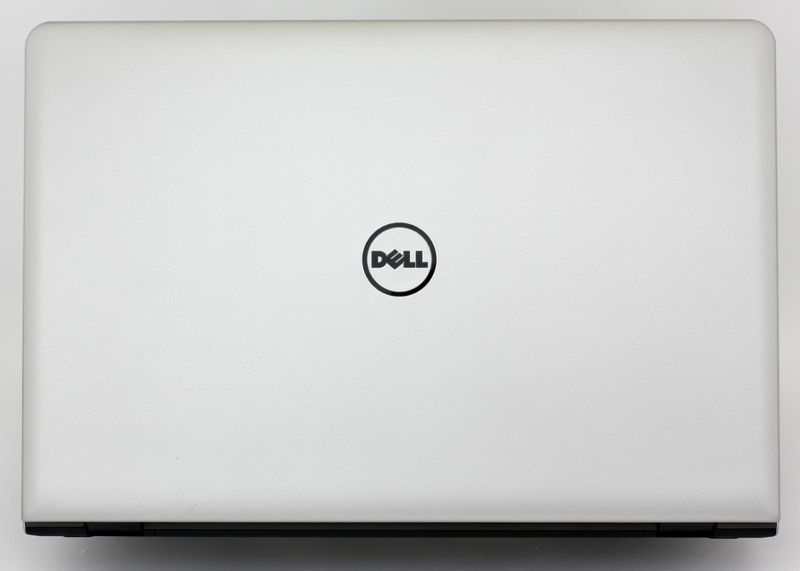 As we already mentioned, the Inspiron 5759 comes in a nearly identical casing as its predecessor with one small, but noticeable difference. The casing is now thinner as the 5759 cuts of nearly 5 mm from its height and it’s now 19.41 mm compared to last year’s 24-27 mm. The lid is covered in silver-colored plastic with dot patterns aiding the grip at some extent and more importantly – keeps the fingerprints and smudges away. The material seems to be flexible, but when pressed doesn’t cause ripples to appear on the screen. 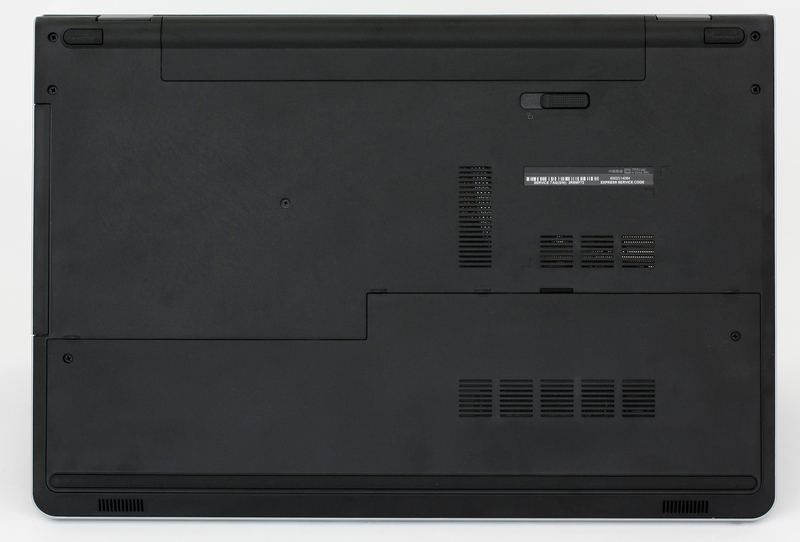 The screen is held by two hinges, which are slightly overtightened because opening the device with one hand is impossible. On the other hand, it feels secure and the panel isn’t too flexible between the two hinges. The bottom piece consists of the same hard plastic material with the big service lid held by two screws near the front end. 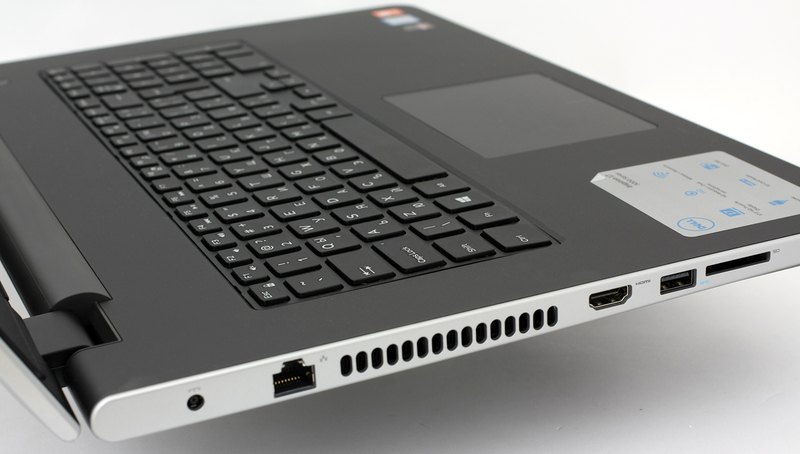 It gives access to the 2.5-inch HDD/SSD and RAM chips. The sides are again flat and metallic-colored but noticeably thinner than before – 19.41 mm. 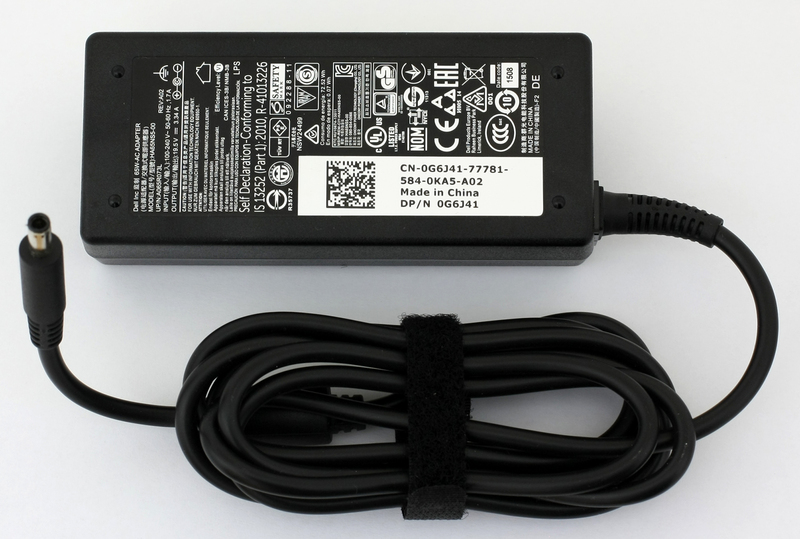 As usual, the left side holds the DC charging port, main exhaust vent, LAN, one USB jack, HDMI and SD card reader. The left side holds the other two USB ports, 3.5 mm audio jack and the optical drive. We are left with the interior where things seem to be just okay for the price range. We are not going to lie, we’ve seen better keyboards in even cheaper notebooks (Acer Aspire E5-573, Acer V15 (V3-575G), and even the F5-572G, along with some ASUS, Lenovo and Toshiba alternatives). However, they are all 15-inch notebooks, so if you still prefer the bigger screen you are entitled to a little spongy keyboard with no LED backlight, relatively short key travel but decent ergonomics, key size and spacing. We are also neutral to the touchpad as it offers good surface, light key presses but a bit jumpy and inaccurate mouse cursor at times. Also, the area around the keyboard is rubberized or even maybe too much for our taste as dust builds up really easily, yet keeps the fingerprints virtually invisible. At the end of the day, the Inspiron 5759 offers decent build for the asking price but nothing too special at the same time. We have lower than usual weight of around 2.83 kg and quite thin profile – 19.41 mm. 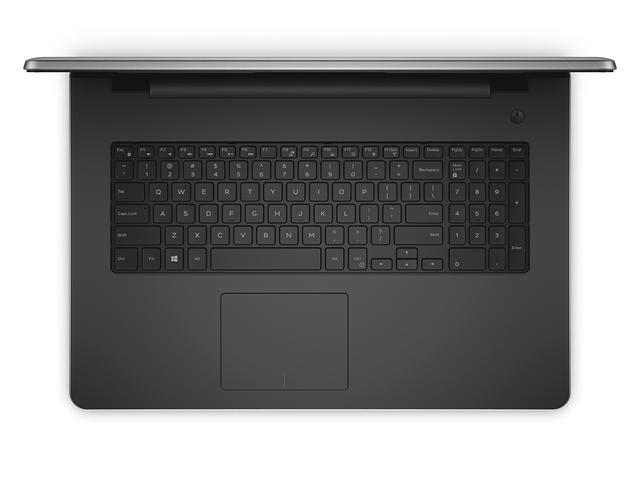 Still, we are left with more to be desired from the keyboard and touchpad experience in contrast to the tightly pulled screen hinges and portability for a 17-inch multimedia notebook. Oh, and another USB port, for example, would have been appreciated, because that’s one of the main reasons people seek bigger form factor. 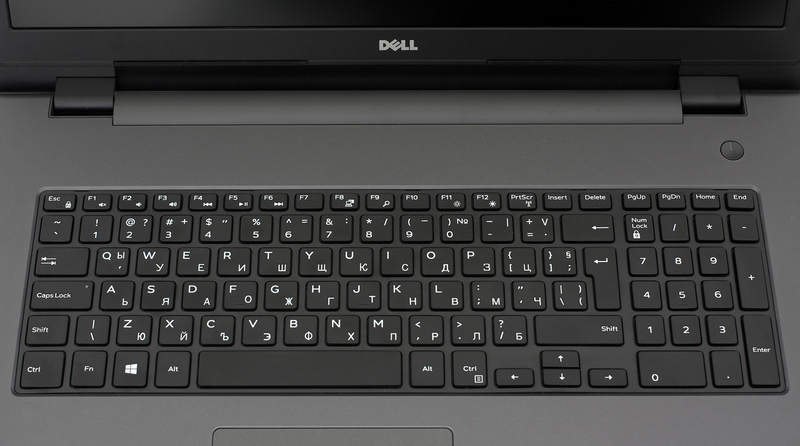 Dell Inspiron 5759 uses roughly the same panel as its predecessor (AU Optronics B173HTN), the Inspiron 5758, but with slightly different readings on some tests. Mostly better, though. This is a good thing because we really liked the display quality of the last generation, despite the TN technology of the panel. Again we are dealing with a Full HD (1920×1080) TN panel with 17.3-inch diagonal, 127 ppi and 0.199 x 0.199 mm pixel pitch. This means the screen can be considered as “Retina” when viewed from a distance equal or greater than 69 cm. Here’s how the screen looks from a 45-degree angle. The color shift is due to the use of a TN matrix. We recorded really high maximum brightness in the middle of the screen – 365 cd/m2 while the average was 343 cd/m2 meaning that the maximum deviation is just 10%. 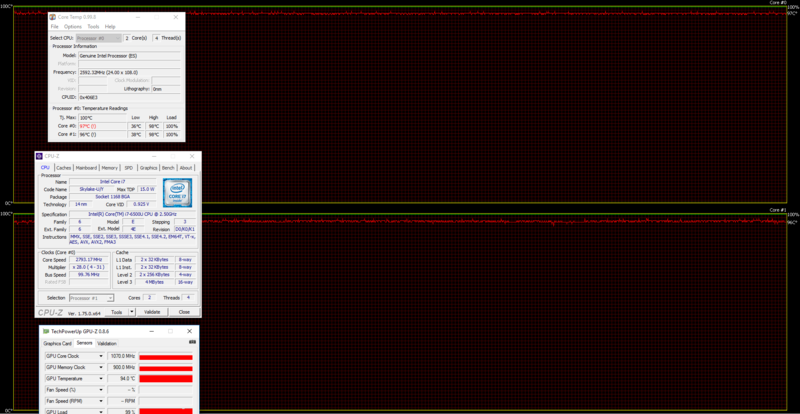 The color temperature appears to be colder than the optimal – 7520K in the middle and 7540K as average. Colors will appear blue-ish or colder than usual. We also measured the color difference dE2000 which is 2.3 in the upper-left corner of the display and 2.2 in the lower-right corner. To make sure we are on the same page, we would like to give you a little introduction of the sRGB color gamut and the Adobe RGB. Starting with the CIE 1976 Uniform Chromaticity Diagram that represents the visible specter of colors by the human eye giving you a better perception of the color gamut coverage and the color accuracy. Inside the black triangle, you will see the standard color gamut (sRGB) that has been used by millions of people in HDTV and on the web. As for the Adobe RGB, this is used by professional cameras, monitors and etc. for printing. Basically, colors inside the black triangle are used by everyone and this is the essential part of the color quality and color accuracy of a mainstream notebook. 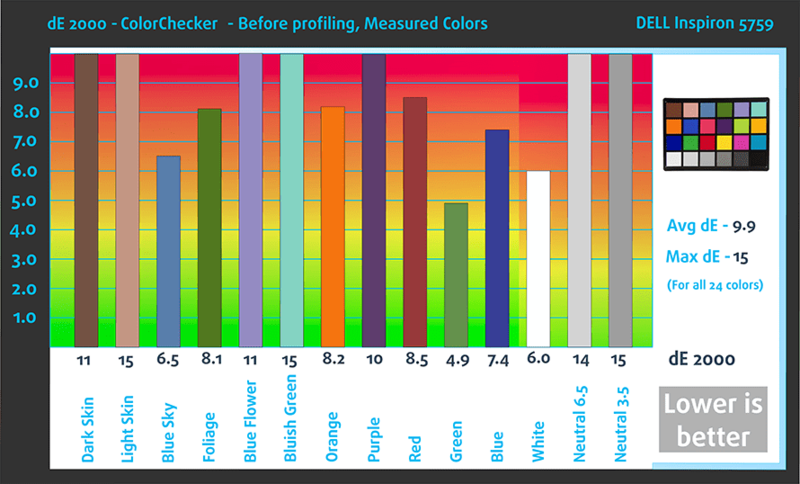 Again the panel demonstrates good properties with almost full sRGB coverage – 93%. For the record, last year’s model achieved a result of 95%. Below you will see practically the same image before and after calibration. Color circles represent the reference colors and white circles being the result. 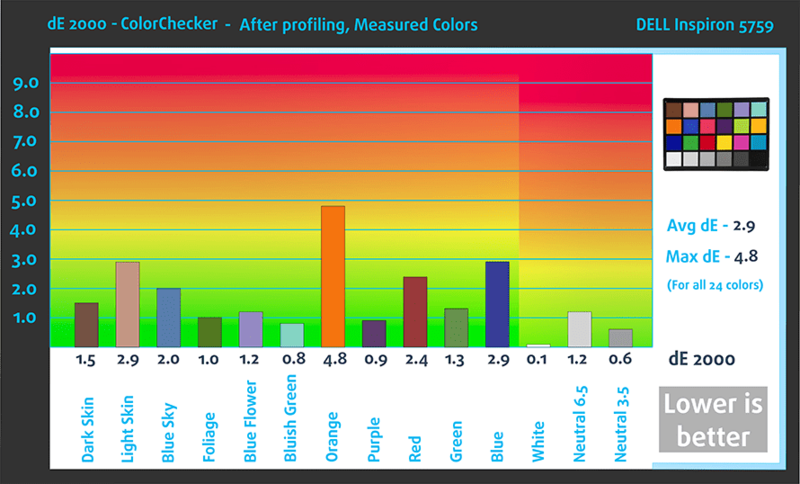 You can see main and additional colors with 25%, 50%, 75% and 100% saturation inside the sRGB gamut. The profile has been set to 140 cd/m2 and optimal white point – D65 (6500K). The contrast ratio isn’t one of the highest we’ve measured but it’s excellent for a TN panel – 820:1 before and 750:1 after calibration. Just like before, the notebook’s display uses PWM from 0 to 99% brightness and the frequency of the pulsating light is just 200 Hz making it fall into the “aggressive” category. It might cause some unwanted eye soreness or headaches to users with more sensitive eyes. 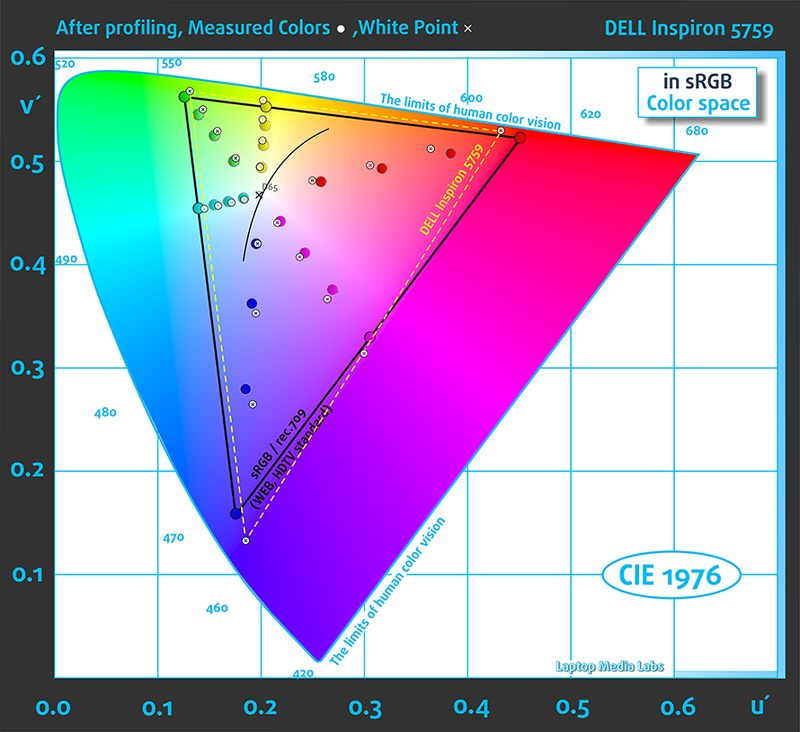 This year’s Inspiron 5759 didn’t disappoint in terms of multimedia capabilities offering a high-quality TN panel with numerous good properties like good sRGB coverage (93%), high contrast ratio (820:1), for a TN panel that is, and high maximum brightness (343 cd/m2). These are essential properties for good image quality and the only thing missing here are the good viewing angles but since we are dealing with a mid-range 17-inch laptop with a TN panel, we can let that one pass. 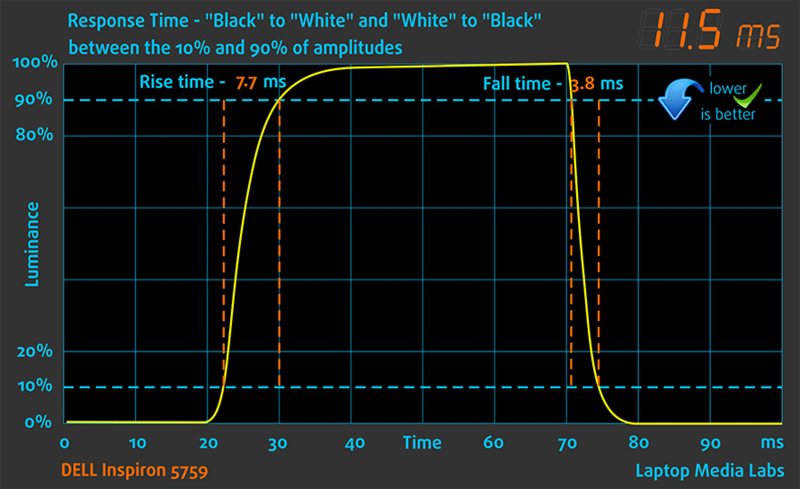 However, the use of PWM for adjusting screen brightness with really low frequencies (200 Hz) is a big drawback to consider, especially if you are a person with sensitive eyes. The overall sound quality is decent but we noticed some slight distortions at some point. We used freshly installed Windows 10 (64-bit) for the writing of this review. 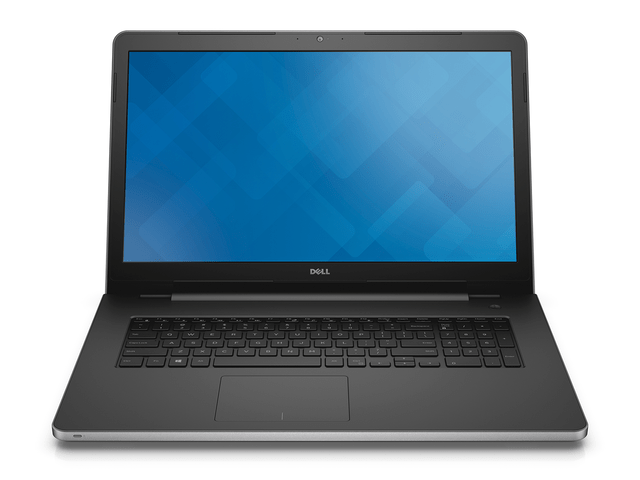 You can download all the needed drivers from Dell’s official website. The Inspiron 5759 houses the same unit as last year’s model (40Wh) but we saw some slight increase in the browsing and video playback tests – around 6-10%. We can easily say that this is due to the more optimized Skylake CPU since the panel is mostly the same and the GPU doesn’t play a role when it comes to light tasks like browsing and watching a movie. Anyway, all tests were run using the same settings as always – Wi-Fi turned on, power saver switched on and screen brightness set to 120 cd/m2. Just about average result here – 328 minutes (5 hours and 28 minutes). Slightly lower result but still better compared to last year’s variant – 282 minutes (4 hours and 42 minutes). Intel Core i7-6500U is part of the Skylake generation processors and it’s entitled to the ULV lineup (ultra-low voltage) with 14nm FinFET manufacturing process. It has two cores that support Hyper-Threading technology resulting in up to 4 threads. The chip is a direct successor to the Core i7-5500U Broadwell CPU expecting slightly better performance with emphasis on the power efficiency features. The CPU is clocked at 2.5 GHz and can go up to 3.1 GHz for one active core or 3.0 GHz for two active cores. Also, the silicon includes an Intel HD Graphics 520 iGPU that sports 24 Execution Units ticking at 300 MHz and can go up to 1.05 GHz. The whole SoC supports DDR4-2133/DDR3L-1600 memory in a dual-channel array. So the whole chip is rated at 15W TDP including the memory controller and the integrated graphics thus making it suitable for 11-inch notebooks or bigger. It also supports the cTDP down feature and the OEM can lower the TDP to 7.5W. Fritz is a chess benchmark that tests the computing capabilities of the CPU with various chess moves. The Intel Core i7-6500U reached 6.327 million moves per second. By comparison, one of the most powerful PCs, Deep(er) Blue, was able to squeeze out 200 million moves per second. In 1997 Deep(er) Blue even beat the famous Garry Kasparov with 3.5 to 2.5. AMD Radeon R5 M335 is an entry-level graphics card that is mostly used in entry-level notebooks. The GPU is a Tonga derivative supporting DirectX 12, Vulkan and even FreeSync. The chip is clocked at 1070 MHz, which is particularly high for its class, but the 64-bit DDR3 memory, clocked at 2200 MHz (effective) serves as a bottleneck in this situation. Also, the chip is manufactured using a 28nm process and adopts 320 shaders built on the GCN architecture. Moreover, the chip includes several useful decoders such as MPEG-4 AVC/H.264, VC-1, MPEG-2, Multi-View Codec (MVC), MPEG-4 part 2 (DivX, xVid) HD, and Flash. The chip also integrates some features that reflect on power consumption like ZeroCore for reduced power demand when the display is turned off and Power Gating for switching off areas of the chip that are not currently in use. The R5 M335 also supports HD Audio (TrueHD or DTS Master Audio) via HDMI and DisplayPort. This test doesn’t represent real-life usage because the majority of users can’t reach 100% CPU + 100% GPU load for such long periods of time and the nature of the notebook doesn’t allow it. Yet, it’s still a good way to assess the cooling capabilities of the machine and the stability of the system in the long run. 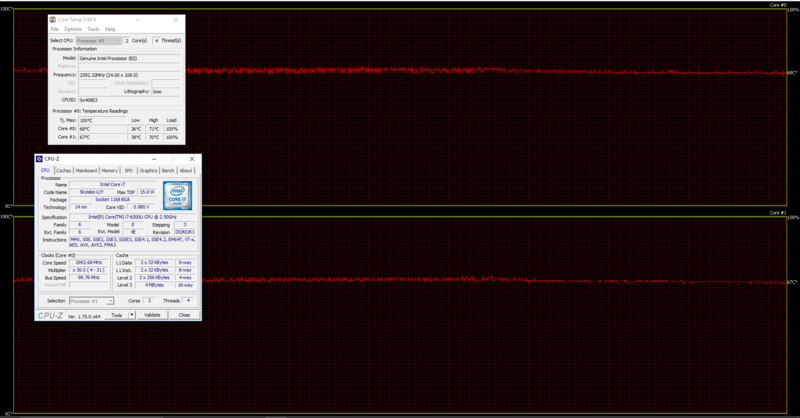 We start with 100% CPU stress test for about an hour. The silicon was able to utilize its full potential at the beginning, ticking at 3.1 GHz, which is the maximum operating frequency for two active cores, but shortly after got down to 3.0 GHz. This is still in the Turbo Boost range so it cannot be considered as thermal throttling or anything. Temperatures were relatively low – 71 °C. After an hour had passed, we turned on the GPU stress test and things started to heat up. The CPU reached dangerously high temperatures (98 °C) while the GPU was also really hot – 94 °C. Interestingly enough, though, both chips maintained almost maximum operating frequencies without thermal throttling. We would like to remind you that the nature of the test is really harsh but on the other hand, this is one of the few notebooks with ULV (ultra-low voltage) processor and low-end GPU to reach such high temperatures. Still, temperatures on the surface were in the normal realm. 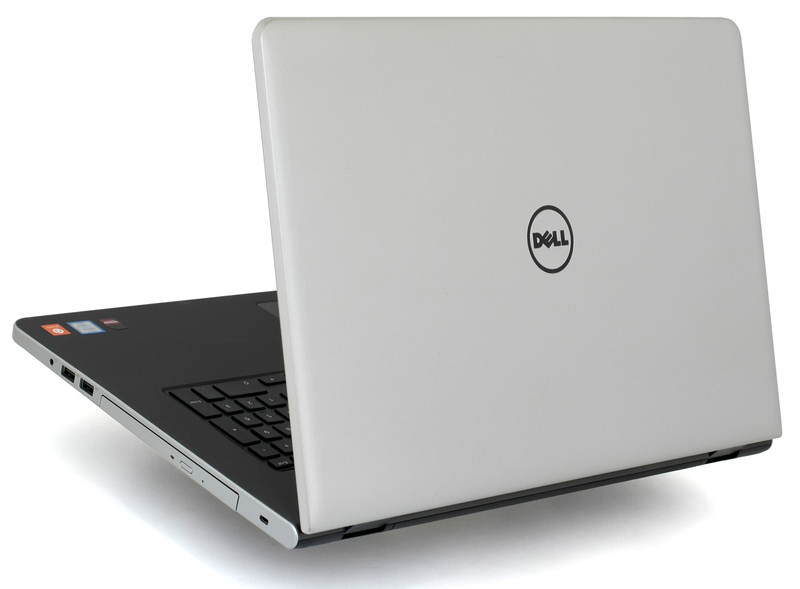 The Inspiron 5759 is a good all-rounder like the 5758 but fails to deliver in some key areas considering the price point of the product. It has the same elegant, strict design with little improvement in the portability section – it’s now considerably thinner. However, you’re still entitled to the spongy keyboard and rubberized finish in the interior, which easily attracts dust and it’s a bit hard to clean it off. In the hardware department, the CPU fits the pricing as well as the TN panel, which, by the way, performed really well again (except for the use of PWM), because most 17-inchers tend to be on the more expensive side, but we cannot say the same about the GPU. Last year’s 5758 was better off with the NVIDIA GeForce 920M since the Radeon R5 M335 in the new model doesn’t quite cut it. 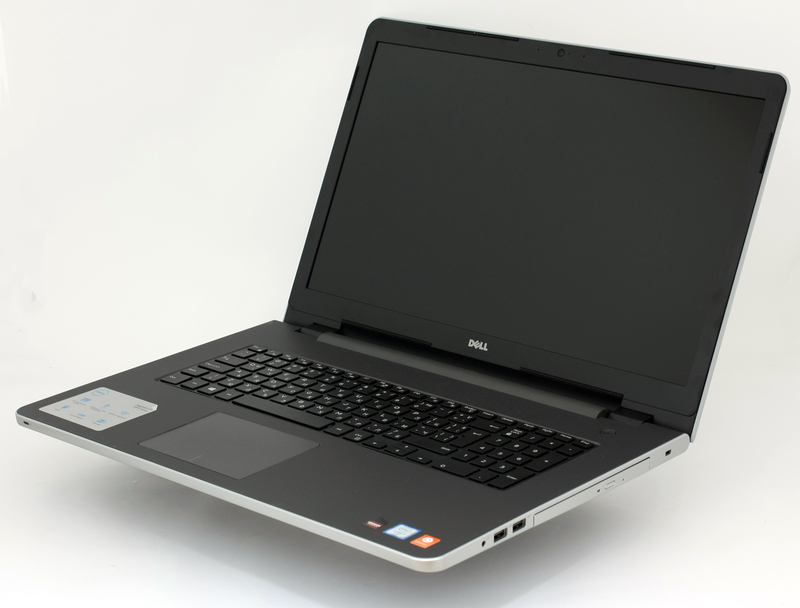 Again, if you are looking for a 17-inch device, the Dell Inspiron 5759 is okay, but there are far better 15-inch options with more to offer or you can also take a look at the Pavilion 17, Aspire E5-773G or the HP ProBook 470 G3, which all have a tad better performance/price ratio. Also, we’ve noticed some oddly high temperatures under heavy workload, which weren’t present in the previous version and this may be due to the GPU. And finally, the battery life is little better because of the 6th generation CPU but hardly noticeable.